Solicitors’ Brands and Franchises - OTT? It has become a recent trend in the legal profession for solicitors to start forming brand names and franchises. I think this can be traced back to a commentator who appears regularly in the Law Society Gazette called Neil Myerson who is a Professor at a university somewhere in the UK. Professor Myerson has warned constantly about solicitors’ firms being eaten up by large multi-nationals coming into the market when the alternative business structures start to form in October 2011. Since then we have seen Quality Solicitors, the High Street Lawyer brand and now one called Face to Face. All of these appear to charge their members considerable amounts of money, promising advertising in return and forming large groups of firms able to compete in the national marketplace. I voice a minority opinion I suspect, but I think that any firm signing up to these brands is probably flushing a rather large portion of cash straight down the toilet. Franchising, which is what this model is, has been around for many years. You can purchase franchises in anything including Costa Coffee, McDonalds, Burger King, health and fitness clubs, estate agents, and many more. Most of the time these franchises are simply a way for large businesses to spread their operations and ensure other people take on the risks involved. I imagine that for the majority of time most companies are better off not being franchised and instead using the money they would have spent on the franchise to market their own business and brand name. Consider for example the Paul Rooney Partnership, based in Liverpool and advertising on Classic FM across the country for many years for Accident and Personal Injury matters. Some of these brand names just sound as if a new business has opened up and do not really explain very much about what benefits you get as a consumer from using a firm working through a franchise than using a firm on the high street who have been there for many years. I particularly admire the latest attempts to franchise with an upfront fee of £25,000 and 8% of profits shared with the umbrella company. What difference would it make if a consumer is looking for a solicitor in Stoke on Trent that one of the solicitors’ firms is called Quality Solicitors, the other is called Face to Face and the final one called High Street Solicitor? The consumer can to firms on the high street who have been there for many years and perhaps have an established brand known to a good proportion of the population. Look at accountancy. Many years ago a new accountancy brand came onto the scene with the word "tax" in. There seemed to be quite a lot of firms who signed up for this brand, but if you phoned round for a quote these were actually more expensive than the smaller businesses and it was not clear what advantage one got from going through a company with the word Tax in the title as opposed to going through a company called Smith & Co Accountants. In fact in that case I have to confess to being put off the notion of an accountancy firm with the word Tax because at the time I was looking for an accountant, not someone who could offer me taxation advice. I appreciate this may be my own ignorance but this is an example of how franchises and brands can work against you. The new Face to Face brand is an example of this perhaps. How many consumers want actual face to face advice from their solicitors and how many want 24 hour access via the internet? Does Face to Face really sum up what a consumer wants out of their lawyers or would Lawyer 24/7 perhaps have been the better brand name? Any firm which is thinking about signing up to one of these franchises may want to bear that in mind. As ever I have not written this article to criticise the companies question, or to try and put down the businessmen setting up these business models. I will allow any comments from anyone linked to any of these businesses onto this site including a web link to your own site. Afterall, we are legal recruiters and are supplying legal recruitment services to the legal profession and it hardly serves our own purpose to alienate our customers! Jonathan Fagan is Managing Director of Ten Percent Legal Recruitment, specialists for an integrated recruitment service for law firms offering a low cost system for just £60 per month per law firm. For further details please get in touch. Ten-Percent Legal Recruitment is slowly (very slowly!) revolutionising the way law firms recruit. In July 2011 we decided to alter our fee structure to do add contingency fee-based recruitment and ask law firms who use our services to pay a monthly subscription as an alternative to paying us a lump sum. We set the monthly subscription at a level so low (from £60) that most firms would not even notice they were paying it. We also decided to impose a 5 year membership term to stop any firms planning to take a candidate from us and then cancel within a few weeks! "what a fantastic idea. You have altered my view of recruitment agencies as being money grabbing parasites." Partner, Lincolnshire Firm, September 2011. "your service is outstanding. Within a few days of joining you had found us the candidates we had been looking to recruit for some time." Practice Manager, South East London Firm, August 2011. "If we sign up to your service and recruit from another agency, we will be paying out two lots of recruitment fees." "This deal discriminates against smaller firms. We shall not be using your services in future." (a good percentage of our clients are sole practitioners and firms with less than 10 partners). "We only pay contingency fees because we want to pay for success." Absolutely fascinating. We have also had HR Managers call up to ask why they should give us at least £3,600 when they rarely recruit and it will cost them at least £3,600 whether we are successful or not. They seem to miss the point that their recruitment needs are covered for 60 months - locum, permanent, support staff and fee earners. The service is a membership service, not a one-off recruitment process each time. I suppose after 30 years of recruitment agencies, it is difficult to get away from the mentality of one-off recruitment each time you are looking for a new member of staff. Some law firms have also tried to argue that they should only have to join once we have found candidates and they have interviewed them. A partner at a medium sized central London firm suggested that the service was expensive and comparable with other deals he was getting from the legal recruitment market. To be frank, all of the above is a complete load of nonsense. It reminds me of the time I went to a car boot sale to shift a load of possessions when we were moving house. About half way through the sale, we realised that the remainder of our offerings were not shifting fast enough, and as the plan was to drive home with an empty boot, we started to offer everything at 10p. "how much for your skateboard?" "nothing - we just want to sell it." "hmm.... (examines the skateboard very suspiciously).... I'll think about it." We did not sell very much at all at 10p. We managed to shift a computer that someone actually haggled us up on - offering us 50p. Instead we changed the pricing structure to "everything free of charge". We sat back and waited for a mad rush of customers. It didn't happen. Browsers still came up to the stall, examined the items carefully, asked us how much they were (despite a huge sign saying "Free to a Good Home"). The tale illustrates a human weakness - we are always looking for "the catch". Each one of the partners and HR managers calling me to find out why we are offering recruitment services at such a low price is simply following their human instinct that something is wrong with the service and that is why it is so cheap. Our catch is the commitment. We want 5 years from each firm. If we get 5 years, we are happy to offer recruitment at a ridiculous price. Apart from this? No catches. We have been around a long time. We want to mop up the recruitment market and get the majority of UK law firms on board. If we are first level providers to firms, just about any solicitor or support staff member will register with us in the first instance and not bother with other legal recruitment agencies. Are the days of contingency fees for recruitment agencies in legal recruitment numbered? Probably not. We set the scheme up in 2011, got over 100 law firms signed up and we still do plenty of contingency based recruitment! Its fine with us. 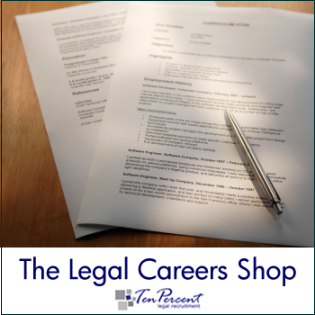 Ten-Percent Legal Recruitment - Online Legal Recruitment for Solicitors, Legal Executives, Fee Earners, Support Staff, Managers and Paralegals. Visit our Website to search our Vacancy Database.